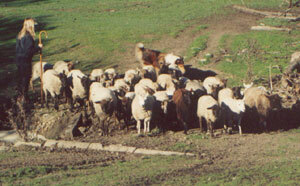 The AWCA Herding Instinct Test Program is run on a pass/not pass system. Collies passing the Herding Instinct Test will be issued a certificate from AWCA awarding the title "Herding Instinct Certified" (HC). AWCA members' Collies will also receive a Versatility point slip. 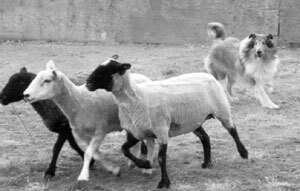 A 12-page Herding Instinct Test Program brochure is available for organizations wishing to sponsor such an event. It includes the details about how to apply for sanction from AWCA, test forms, requirements for tests, and qualifications for passing such tests. This brochure can be obtained from the AWCA Stock Work Coordinator by sending your request accompanied by flat-rate priority mail postage. Currently, this postage is $3.95; please do NOT send money, but send the actual priority mail stamp for this amount so that the Coordinator does not have to make a special trip to the post office.